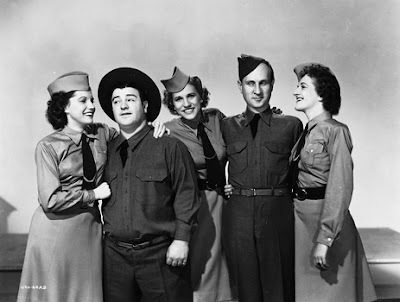 Buck Privates was the film that made Abbott and Costello superstars. The blend of music, comedy and patriotism struck a note in audiences and ended up as Universals biggest hit of the year. It’s a film that I grew up on when it played in rotation on WPIX’s long ended Sunday morning screenings of the duo’s films. Watching the film on a recent snowy Saturday I hunkered down to watch the film for the first time start to finish in probably a couple of decades. Going in I remembered two thing the Andrews Sisters song and the routines. And after seeing it that still all I remember. It’s a funny little time killer but as a whole it’s nothing special. The film has the pair enlisting in the army by accident when they are running from the police. As they go through basic training they crack wise, a friend woos a WAC and the Andrews Sisters sing. The plot line is more a thin thread. Then anything real. The boys end up in the army and that’s about it. Things happen but nothing much is really resolved other than the rich jerk becomes less a jerk. The film is a trifle. It’s an amusing film but nothing truly special as a whole. Yes the music and the routines stand out -Boogie Woogie Bugle Boy was more or less introduced here ending up getting an Oscar nomination as a result. However as a complete film the film really is lacking. There are too many characters, too many digressions, and while nothing is bad, the film never feels wholly satisfying. For me the film isn’t as good as some of the films that followed where there was more of plot line all the way through.